The eight-month-old son of Anna and William Reed died this date, June 30th, in 1848 and was buried at Bethel Burying Ground. The eight-month-old son (unnamed) of Anna and William Reed died this date, June 30th, in 1848 of Marasmus* and was buried at Bethel Burying Ground. Mr. Reed (45 y/o), born in Virginia, was employed as a shoemaker at the time of his son’s death. Ms. Reed (34 y/o), born in Maryland, worked as a laundress. Census records show that one of them was born into slavery. Reviewing the Philadelphia 1847 African American Census and the 1850 Federal Census, it appears that the Reeds suffered the death of two other of their children and Mr. Reed’s sixty-year-old mother. It is likely that some, if not all, also are buried at Bethel Burying Ground. All the Reed children were born in Pennsylvania. The family lived at 16 Bonsall Street below 10th in the “Cedar Section” of the city of Philadelphia. The Reed family had one room in a three-story brick tenement for which they paid $3.12 a month in rent. The average wage for a shoemaker would have been $4-$5 a week and half that for a laundress. The Reed child was interred at Bethel Burying Ground on a warm June day that was “alternately cloudy and clear” with temperatures reaching into the high 80s. * The term “Marasmus” stood for a variety of malnutrition, wasting and starvation illnesses. The condition has been characterized as a disease of the “extremely poor.” Often the infant or child was getting too many carbohydrates (cheaper) and little if any protein (more expensive). In many cases, the individual simply starved to death for lack of any food. Thirty-eight-year-old Eliza Moore died this date, June 27th, in 1843 and was buried at Bethel Burying Ground. Thirty-eight-year-old Eliza Moore died this date, June 27th, in 1843 of “Debility” and was buried at Bethel Burying Ground. “Debility” is only a symptom, not actually a cause of death. Any illness from cancer to influenza could have caused the physical wasting. There is no census or city directory mention of Ms. Moore. Her death certificate was signed by a physician who was volunteering with the Southern Dispensary, a medical clinic for the poor. Ms. Moore lived in the 300 block of Harmony Street, which is now named Fulton Street. The map above shows that she lived only two blocks from Bethel Burying Ground where she was laid to rest. Harmony Street was a narrow crooked thoroughfare filled with working-class Black families and widows. According to the Philadelphia 1847 African American Census, the men’s occupations included sailmaker, oyster seller, and seaman. Women were generally employed as laundresses. Families lived in one room where a 12’x12′ room rented for $2 – $2.50 a month which would be close to a week’s salary. Ms. Moore was one of only eight individuals in her age group that died in Philadelphia in 1843 of “Debility.” By contrast, four hundred forty-eight children died of this diagnosis during the same period. Ms. Moore was interred at Bethel Burying Ground on a clear, hot day where the temperature rose to over 100 degrees. 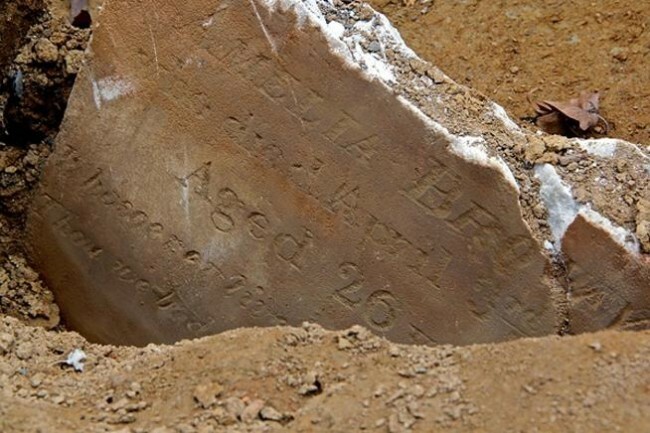 The eighteen-month-old son of Maria Bayles died this date, June 25th, in 1846 and was buried at Bethel Burying Ground. The eighteen-month-old son of Maria Bayles died this date, June 25th, in 1846 of Marasmus* and was buried at Bethel Burying Ground. An 1846 Philadelphia African American Census worker contacted Ms. Bayles after her son died. The Census reports that Ms. Bayles was a single woman working as a domestic who lived at 15 Washington Street paying $2 a month for a room which was about what she made for a week’s work. Ms. Bayles reported to the census taker that she attended church services and was a member of a beneficial society that likely assisted her in paying the funeral expenses for her son. Ms. Bayles lived with her son on Washington Street (now Rodman Street, see the red marker below) which was between 11th and 12th Streets and Lombard and South Streets. “Freedom Paper” issued by a Philadelphia Justice of the Peace. *”Marasmus” stood for a variety of malnutrition, wasting and starvation illnesses. The condition has been characterized as a disease of the “extremely poor.” Often the infant or child was getting too many carbohydrates (cheaper) and little if any protein (more expensive). In many cases, the individual simply starved to death for lack of any food. The nine-month-old Jackson child died this date, June 22nd, in 1835 and was buried at Bethel Burying Ground. The nine-month-old Jackson child (gender not specified) died this date, June 22nd, in 1835 of “Summer Complaint” (Cholera) and was buried at Bethel Burying Ground. The child did not have a death certificate and was only recorded on the burying ground’s weekly summary of those interred. The child’s father was Isaac Jackson and, according to the 1836 Philadelphia African American Census, he was employed as a “laundering dealer” and his spouse (unnamed) was employed as a laundress. It appears that they both worked in a family business. In addition to the deceased child, the Jacksons had two other children. All the children and one adult were born in Philadelphia. One of the adults was formerly enslaved and gained his or her liberation through manumission. The Census records reported that the family attended church services at Wesley AMEZ. The red arrow indicates the location of the Jackson family home in what now is known as the 600 block of Bainbridge Street in south Philadelphia. According to the 1836 Census, the Jackson family lived on “Shippen Street below 7th Street,” what now is known as the 600 block of Bainbridge Street. Ten months previous to the Jackson child dying, Shippen Street was overrun by a large violent mob that destroyed two Black churches and thirty-seven homes of African American citizens on Shippen Street and the surrounding blocks such as Baker, Small, St. Mary’s and Bedford Streets. Several African Americans were killed and dozens horribly injured by white gangs with the names of Gunner, Punch, and Big Gun. There were pockets of resistance. However, they were quickly overrun. Black families escaped into other parts of the city or “trembled” in the back of dark cellars. * It is not known which path the Jackson family took. Ms. Jackson would have been 8 to 9 months pregnant with her aforementioned child. The nine-month-old Jackson child was one of the 213 children under a year-old who died of Cholera in Philadelphia in 1835. Of the surviving death certificates for all of those buried at Bethel Burying Ground, 126 are recorded to have died from Cholera. The death rate among Blacks was twice that of whites. The child of Isaac Jackson was interred on a sunny day with light wind. The temperature reached 71 degrees at 3PM. *Macon (GA) Weekly Telegraph, 28 August 1834. Sixty-eight-year-old Rachel Brown died this date, June 17th, in 1840 and was buried at Bethel Burying Ground. Sixty-eight-year-old Rachel Brown died this date, June 17th, in 1840 of ovarian cancer and was buried at Bethel Burying Ground. Ms. Brown was a widow living with her adult children. In addition to Ms. Brown, there were five other family members. Four out of the six were born in Pennsylvania. Her oldest son was a seaman, according to the Philadelphia 1836 African American Census. There was another son occupied as a house painter. The Brown family worshipped at Bethel AME Church. The Brown family lived on Little Oak Street, a dead end alley barely over the border from the city into the Southwark District in south Philadelphia. The modern map below shows the location of Little Oak (red arrow) and the location of where the educator and civil rights activist Octavius V. Catto lived and was assassinated (purple arrow). During the gruesome anti-African American riots of the 1830s and 40s, this area was a war zone. The crazed white mobs advanced through the neighborhood pillaging, burning and murdering any Black man or woman that was unlucky enough to be caught outside. Many Black families left the city and escaped by ferry to Camden, New Jersey. The small city police force was overrun often by gangs with the names of Rats, Killers, Blood Tubs and Bouncers. Little Oak Street is now known as Kenilworth Street. Two-year-old Charles White died this date, June 15th, in 1846 and was buried at Bethel Burying Ground. Two-year-old Charles White died this date, June 15th, in 1846 due to Hydrocephalus and was buried at Bethel Burying Ground. According to the 1850 Federal Census, the child’s parents were Issac White (47 y/o) who was employed as a brickmaker and Eliza (39 y/o) who worked as a laundress. Both were born in the state of Delaware. At the date of their son’s death, they also were the parents of Louisa (10), Eliza, Jr. (6) and Harrison who was newly born. All the children were born in Pennsylvania. The family lived in one room in a tenement on George Street for which they paid $3.31 a month. George Street, now Samson Street, is in center city Philadelphia. The 1600 block of George Street, near Rittenhouse Square, was home to sixteen African American families with a total of eighty-five members, according to the Philadelphia 1847 African American Census. The list of their occupations reflected that the majority of them were in that area to service the local wealthy white families and the upscale restaurants they frequented. There were numerous male barbers, waiters, and coachmen, while the women in the families were employed as seamstresses, laundresses, and domestics. The cause of death for the two-year-old Charles White was hydrocephalus. The disease could be congenital or acquired. Which form of the disease the child had was not mentioned by the attending physician. The increase in central nervous system fluid pressing on the brain (“water on the brain”) almost always was fatal before the invention of modern anti-bacterial drugs and sterile surgical methods. The fatal increase of fluid on the brain could have been caused by numerous diseases including Mumps, German Measles, Meningitis, and Syphilis. The White family buried their baby on an unusually “damp, raw, cold and cloudy” day in June. The following day the temperature would rise to 85 degrees.